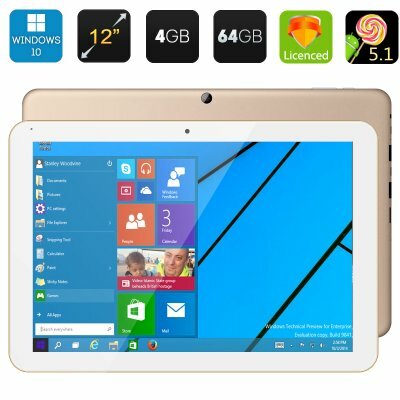 Successfully Added Chuwi Hi12 Tablet PC - 12 Inch Screen, Windows 10 + Android 5.1, Cherry Trail Quad Core CPU, 4GB RAM, Bluetooth 4.0 (Golden) to your Shopping Cart. Enjoy a large 12 inch screen and Windows 10 + Android 5.1 interface on the Chuwi Hi12 Tablet PC. Coming with a 64bit Quad Core CPU, Bluetooth 4.0 and two cameras, it’s a great tool for work and fun. Have loads of fun with a large screen tablet PC or use it as an efficient working tool. The Chuwi Hi12 comes with a 12 inch 2160x1440 IPS display and runs Windows 10 as well as Android 5.1. You will not only be able to see all of your media content on great quality on a large screen, but also reap all the benefits of having Windows 10 run the show. The new OS comes with lots of upgrades and makes navigation a breeze, you can also use the Google Play under Android 5.1 to download all your favourite aps and games. The Android + Windows tablet comes with two cameras and Bluetooth 4.0 for easy communication with other devices. The 11000mAh battery will give you up to 4 hours of continuous video playing time and 72 hours on standby. Powered by Intel Atom Cherry Trail Z8300 64bit Quad Core CPU, the tablet will perform all your commands quickly and efficiently. With the Intel HD Graphics (Gen8), you are also sure to be on top of your game. The Chuwi Hi12 features great external connectivity with a micro SD card slot, micro USB slot, 2xUSB ports, micro HDMI and more. So, you won’t have any trouble hooking it up to an even bigger screen, transferring content or upgrading the storage. The Windows 10 tablet comes with 64GB of internal memory and you can add 64GB more with an SD card. The Chuwi Hi12 Tablet PC comes with a 12 months warranty. Brought to you by the leader in electronic devices as well as wholesale Android + Windows tablet PCs..